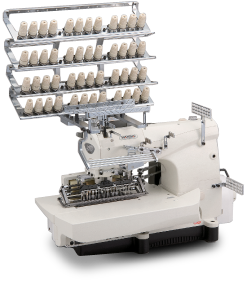 NB series is a flatbed, multi-needle double chain stitch machines. 25 or 33 needle machines are available due to vertical movement of the looper. Also, there are variety of gauges, which are selectable according to the operation. The smocking models(PSM & PSSM) are equipped with four spreaders for the decorative threads. This innovation enables a greater variety of different designs. The machine is suitable for attaching elastic, smocking and shirring, etc. for interior goods or ladies’ wears.